The Pirates of the Caribbean franchise is one that has been reliable at the box office but, in terms of quality, it has been diminishing ever since the first one in the eyes of most fans and critics. Disney is hoping to change that this summer with Pirates of the Caribbean 5 and, if the early reactions are to be believed, they just might. The entire movie has just screened for the first time and, even though reviews are under embargo for a little while longer, the first social media reactions are in. And they are mostly positive. Disney decided to screen the entirety of Pirates of the Caribbean: Dead Men Tell No Tales to a crowd at CinemaCon last night in Las Vegas. Those in attendance were mostly industry professionals of some kind and, they couldn't post their full reviews, but many of them took to Twitter to give their initial thoughts. Most everyone seemed to be pleasantly surprised by the movie, which could have a lot to do with the fact that expectations were probably fairly low heading into it. Here is what Fandango Managing Editor Erik Davis had to say about it, and his opinion seemed to mirror that of the majority. "Thing I liked most about #PiratesoftheCaribbean is it felt the most like the first movie, which is my personal favorite. Strong finale." The last Pirates movie, Pirates of the Caribbean: On Stranger Tides, came out back in 2011 and, outside of Johnny Depp as Jack Sparrow, it largely featured a new cast. That strategy didn't really work, at least critically speaking. But the movie did make more than $1 billion at the box office, which essentially ensured that Disney would give it another go. 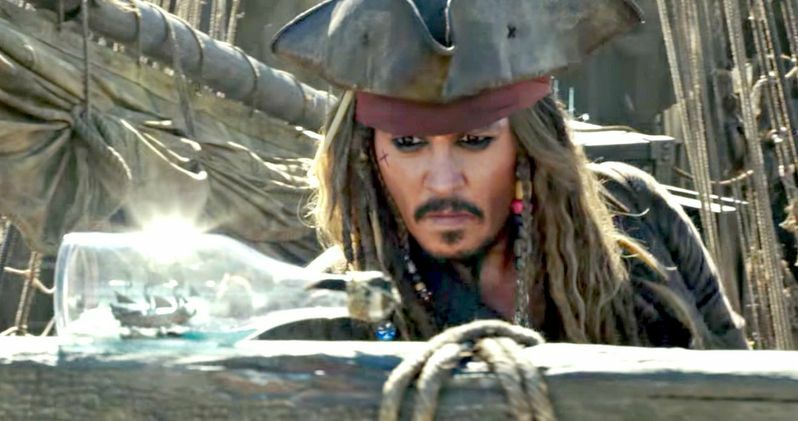 With Pirates of the Caribbean 5, they are bringing back a lot of familiar faces and, if these early reactions are any indication, that strategy paid off. Here is the official synopsis for Pirates of the Caribbean: Dead Men Tell No Tales. "Thrust into an all-new adventure, a down-on-his-luck Captain Jack Sparrow finds the winds of ill-fortune blowing even more strongly when deadly ghost pirates led by his old nemesis, the terrifying Captain Salazar (Bardem), escape from the Devil's Triangle, determined to kill every pirate at sea...including him. Captain Jack's only hope of survival lies in seeking out the legendary Trident of Poseidon, a powerful artifact that bestows upon its possessor total control over the seas." Pirates of the Caribbean 5 is bringing back Geoffrey Rush as Barbossa, Orlando Bloom as Will Turner and Kevin McNally as Joshamee Gibbs and Stephen Graham as Scrum. The supporting cast also includes franchise newcomers Kaya Scodelario, Brenton ThwaitesGolshifteh Farahani, Javier Bardem and Sir Paul McCartney. Pirates of the Caribbean: Dead Men Tell No Tales is being directed by Joachim Rønning and Espen Sandberg and is set for release on May 26, 2017. Be sure to check out some of the other initial reactions to the movie for yourself below.